Come and enjoy drinks and dinner on our popular Rooftop in a Mediterranean style garden setting! Rated best in White Plains! Featured in Westchester Magazine’s “Hidden Gems” . Is your family arguing about what to have for supper? Give them something everyone can agree on at Esposito’s Ristorante & Pizzeria. You can dine in, carry out, or have your favorite food delivered. Every member of your family will find something they love from pizza and calzones to chicken and veal. Call for your reservation today and enjoy fresh, authentic Italian cuisine. Call today to place your order on all your favorites and receive free delivery. Order must be a minimum of $10 for free delivery to apply. No matter what the occasion is, you can have great tasting Italian food catered to your event. 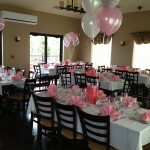 Trying to find somewhere to host your next Private Event? information on our Private Events page. Whether you are craving the usual or want to try something different, Esposito’s Ristorante & Pizzeria has something for everyone. Stop by today for made fresh food and weekly specials.